Renal Artery Stenosis Renal artery stenosis is a blockage of an artery to the kidneys. It may cause kidney failure and hypertension (high blood pressure). Renal Artery Thrombosis Renal artery thrombosis is the formation of a clot in a renal artery. A thrombosis of a renal artery may cause kidney failure because of blocked blood flow to the kidney. Renal Artery Aneurysm A renal artery aneurysm is a bulging, weakened area in the wall of an artery to the kidney. Most of these aneurysms are small (less than two centimeters, or about three-quarters of an inch) and without symptoms. Renal artery aneurysms are uncommon, and are generally discovered during diagnostic procedures performed in relation to other conditions. 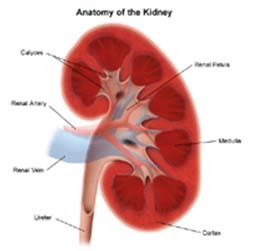 Atheroembolic Renal Disease Atheroembolic renal disease occurs when a piece of plaque from the aorta and/or other large arteries breaks off and travels through the bloodstream, blocking small arteries such as the renal arteries. Atheroembolic renal disease is becoming a common cause of renal insufficiency (poor kidney function) in the elderly. Renal Vein Thrombosis A renal vein thrombosis is the formation of a clot in a vein to the kidney. Renal vascular disease is often associated with hypertension (high blood pressure). Hormones which influence blood pressure are affected by kidney function. Decreased blood flow to the kidney(s) as a result of renal vascular disease may cause an excessive amount of renin to be produced. Renin is a powerful hormone that increases blood pressure. Renal Artery Stenosis Stenosis (blockage) of a renal artery may be caused by atherosclerosis (a build-up of plaque, which is a deposit of fatty substances, cholesterol, cellular waste products, calcium, and fibrin in the inner lining of an artery) or other conditions, such as fibromuscular dysplasia (a condition that weakens the walls of medium-sized arteries and occurs predominantly in young women of childbearing age), and Takayasu's arteritis (a rare inflammatory disease affecting the aorta and its branches, including the renal arteries). Atherosclerosis is the cause of about 80 percent to 90 percent of renal artery stenosis. Renal Artery Thrombosis Formation of a thrombosis (clot) inside one of the renal arteries may occur as a result of trauma, infection, inflammatory disease, renal artery aneurysm, or fibromuscular dysplasia. Atheroembolic Renal Disease Small pieces of plaque (emboli) from atherosclerosis formation in other arteries of the body may break off and travel to the renal arteries, blocking blood flow to the kidney. Emboli may occur because of surgery, insertion of a catheter, or the use of blood-thinning medications. The disease most commonly affects older persons. Renal Vein Thrombosis Conditions associated with the presence of renal vein thrombosis include trauma, compression of a renal vein by an adjacent structure such as a tumor or aneurysm, nephrotic syndrome (results from damage to the kidneys' glomeruli, the tiny blood vessels that filter waste and excess water from the blood and send them to the bladder as urine), pregnancy, administration of steroid medications, and use of oral contraceptives (birth control pills). The symptoms of renal vascular disease may resemble other medical conditions or problems. Always consult your physician for a diagnosis. arteriogram (Also called an angiogram.) : - an x-ray image of the blood vessels used to evaluate various conditions, such as aneurysm, stenosis (narrowing of the blood vessel), or blockages. A dye (contrast) will be injected through a thin flexible tube placed in an artery. This dye makes the blood vessels visible on x-ray. duplex ultrasound : - a type of vascular ultrasound procedure done to assess blood flow and the structure of the leg veins. The term "duplex" refers to the fact that two modes of ultrasound are used - Doppler and B-mode. The B-mode transducer (like a microphone) obtains an image of the carotid artery being studied. The Doppler probe within the transducer evaluates the velocity and direction of blood flow in the vessel. renography : - a specialized radiology procedure used to assess the function and structure of the kidneys. Renography is a type of nuclear radiology procedure. This means that a tiny amount of a radioactive substance is used during the procedure to assist in the examination of the kidneys. magnetic resonance angiography (MRA) : - a noninvasive diagnostic procedure that uses a combination of magnetic resonance technology (MRI) and intravenous (IV) contrast dye to visualize blood vessels. Contrast dye causes blood vessels to appear opaque on the MRI image, allowing the physician to visualize the blood vessels being evaluated. open surgical procedures to bypass the occluded renal artery. There are several variations of such procedures. Treatment of a renal artery thrombosis depends on the type (acute or chronic) of thrombosis, and the length of time since the thrombosis occurred. Surgery to remove the clot or bypass the artery may be performed in some situations. Larger aneurysms (greater than two centimeters or three-quarters of an inch), dissecting aneurysms, aneurysms causing kidney ischemia (lack of blood flow to the kidney tissue) and hypertension, aneurysms that are growing larger, and aneurysms causing symptoms may be treated surgically. Because of the increased risk for rupture (bursting), a renal artery aneurysm in a pregnant woman or a woman of child-bearing age will generally be treated surgically. Treatment of atheroembolic renal disease depends on the extent of the disease and the individual situation. Medical treatment may include medications to reduce cholesterol, blood pressure, and other related medical conditions, such as diabetes.